Position: Relief pitcher. Joe Maddon’s security blanket. Year in Review: Someday, billions of years into the future, the sun will burn out and threaten life as we know it across the galaxy. And as its helium core begins to collapse on itself and it shrinks into a white dwarf, humanity will have to look elsewhere for a reliable source of energy in order to continue life as we know it. This, of course, assumes that by this time NASA will be employing Joseph Maddon XXXIV. 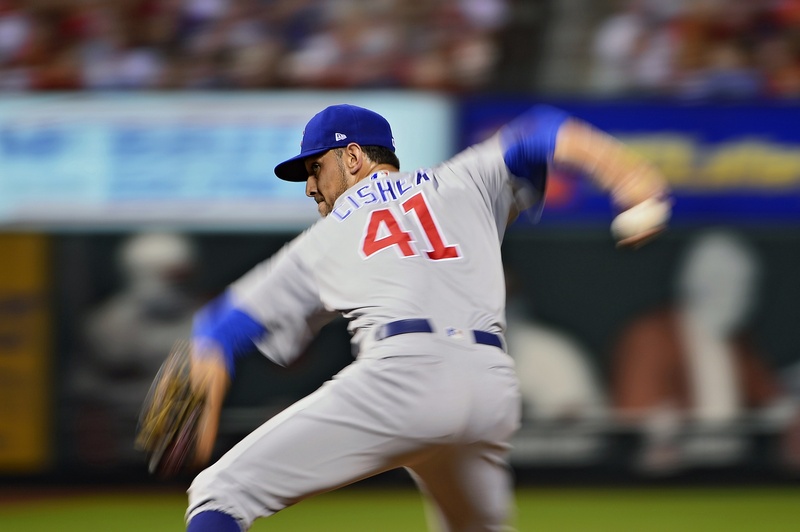 On Opening Day of 2018, Cishek was called upon to make his Cubs debut in the fourth inning to protect a one-run lead with Miami Marlins on first and third and one out. He struck out Starlin Castro and induced Justin Bour to fly out to left field to escape unscathed. And he then proceeded to pitch an eventful but scoreless fifth for good measure, successfully walking the tightrope over another one out, second and third predicament of his own making. Keen observers of the past few years of Cubs baseball immediately knew one thing: Joe Maddon was about to ride Cishek’s arm like it was a 13-year-old The Office reference. The right-hander appeared in 14 of the team’s first 26 games and never really deviated from that pace over the entire season as he would eventually take the mound in 80 contests and the Wild Card Playoff. And for most of the year, he was incredibly effective with his ERA remaining below 2.00 until the beginning of September. Cishek excelled through a pattern of deception by mixing his sinker and slider such that by June, he was throwing both pitches in almost equal proportions. And then around 13 to 14 percent of the time, he would mix in a four-seamer that appeared to rise from his sidearm delivery like he was using it to illustrate the Easter story. If you watched him work at all this season, you could make a pretty educated guess that almost all of those four-seamers were thrown with two strikes. Cishek’s whiff rate on the pitch varied greatly but climbed over 20 percent in three different months, climaxing at 40 percent in May. Which meant that for a brief period of time, a pitch that maxed out at 91 MPH turned Cishek into Josh Hader. Thankfully, Cishek’s social media presence did not. Unless the Shedd Aquarium dolphins in his Instagram were way more racist than any of us thought. The workload finally caught up a bit to the lanky reliever in September as he posted a 4.15 ERA for the month. But more to the point, the combination of baserunners allowed in the final month and his previous innings-load forced him to become more of a situational pitcher as 11 of his 15 appearances in September were for less than an inning. As we watched the workload of the first five months catch up him, every Cishek September appearance felt like the only thing he had to do to succeed was violate every known principle of human anatomical endurance. So when he emerged from the bullpen in Game 162 to strike out Francisco Peña with the bases loaded in the seventh, it was especially heartening to see him pump his fist as if he’d discovered a new Bible verse. If for no other reason than it was good to see any evidence at all that he could still lift his arm above his shoulder. Looking Ahead: Attempting to project future performance from relief pitchers is the easiest way in baseball to make yourself look like an idiot without actually working in the Orioles front office. Nonetheless, you didn’t come to the Looking Ahead section to read “Dunno…Cishek only pawn in game of life…” so let’s see if we can make a slightly more educated guess about what he’ll be in 2019. For starters, Cishek’s 80 appearances and 70.3 innings pitched were both career highs. Combined with his 32 years of age, that indicates that Maddon should probably be more judicious in spacing out the appearances of his favorite sidearmer in 2019. Of course, since the Cubs manager will presumably be under strict orders to do the same thing with Brandon Morrow, that might be easier said than done. That 3.40 FIP and 4.68 DRA both raise some concern that Cishek is due for some serious regression next year as well. However, it should be noted that he also amassed similar peripherals of a 3.31 FIP and 4.02 DRA in 2017 and everything turned out fine. But just in case, the Cubs should station Cishek’s locker as far away from Brian Duensing’s as possible just in case his diagnosis of “Mel Rojas arm” is contagious. Finally, Cishek’s 3.6 BB/9 was his highest rate since 2015. That number in addition to his 2018 workload suggests that the Cubs would do well to assume that he might not be the same pitcher next season. But if he can get that a bit more under control, it might make the difference between another successful season with the Cubs or a step closer to the Carlos Marmol Memorial Relief Pitcher Black Hole. I’m still not sure why the Ricketts decided to transfer that particular feature to the new bullpen. But if Cishek does fall into it, that would make for the most memorable home run celebration dance ever.